For Western Christians, the Transfiguration of Christ is one of the least attended to events in the life of Jesus as applied to the life of the believer. Even though it receives attention twice in the liturgical year -readings for the Transfiguration occur before Lent, and again on August 6th (the traditional commemoration of the Feast itself)- it can be argued that it has the least impact of all the major events of Christ's life. (This is not so in the East, which derives an entire fundamental spirituality of light and glory from an understanding of the Transfiguration.) For this reason there are not many contemporary works in English that cover the Transfiguration. Happily though, Dr. Andreas Andreopoulos -a Greek born Reader in Orthodox Studies at the University of Winchester, (UK)- does take notice of it in his book "This Is My Beloved Son: The Transfiguration of Christ".Andreopoulos' text is not quite scholarship, not quite personal exploration, more akin to meditation and spiritual response. In a way it is the completion of his more scholarly work "Metamorphosis: The Transfiguration in Byzantine Theology and Iconography". As he says in the introduction: "This book may be be described as my response to the mystery of the Transfiguration" (xiv). Through his text he places the Transfiguration as a focal point looking forward to the Passion and Resurrection as well as looking back to Christ's Baptism, and sees in the Transfiguration a revelation of the Trinity.Included within the book are a foreword by Kallistos Ware (another profound interpreter of Orthodoxy to the West), brief introduction, six chapters, and bibliographic notes. In this volume he seeks not so much to explain the Transfiguration event itself, as its continuing influence in the life of the Church and individual believer, arguing that the Transfiguration does double duty as a revelation of the mystery of Christ and of our destiny as human beings. He opens the book with a chapter that introduces major biblical themes that relate to the Transfiguration, such as: as light, glory, and life in Christ; and the remaining chapters will focus on one or another of these and other images. And yet, each chapter is not a totally separate essay, -he constantly alludes forwards and backwards to the various themes that make up the Transfiguration, relating them to the life of the Church and of the believer.Chapter two explores the close connection between Baptism and Transfiguration -a revelation of the new life in Christ that faith in Him offers us. Chapter three brings the imagery of the Mountain of faith (Horeb, Sinai, Sion, Carmel, and Thabor) which provides the separation that leads to revelation. Chapter 4 discusses the Transfiguration as a Miracle -the miracle of the most complete revelation of the Trinity. Chapter 5 treats the Transfiguration as a manifestation of the Uncreated Light of God (the epitome of Eastern mystical experience akin to the Spiritual Mansions of St. Teresa of Avila) and as a precursor of the Eucharist (both the Transfiguration and the Divine Liturgy are here seen as a stepping into the Kingdom of God). Chapter 6 focuses on the imagery of the Resurrection -he writes of seeing the Transfiguration in light of the Resurrection, as a foretaste of what our glorified resurrected bodies will be.An informal writing style and reading pace graces the pages, and he treats the reader not as a student to be lectured, nor as a congregation to be preached to, but as a fellow traveler in the Way of Christ, someone to benefit from his own travel notes, which this reviewer certainly did. Andreopoulos is also the author of a previous book on the Transfiguration, Metamorphosis: The Transfiguration in Byzantine Theology and Iconography. This is My Beloved Son includes only enough exposition of theology and iconography to support the discussion, but its aim is different, as the author states. It is a meditation on the personal meaning of the Transfiguration: how were the disciples changed by what they saw when Jesus led them to Mount Tabor? How did the early church (and the church today) understand and incorporate this transformative experience? How does someone today live a transfigured life? 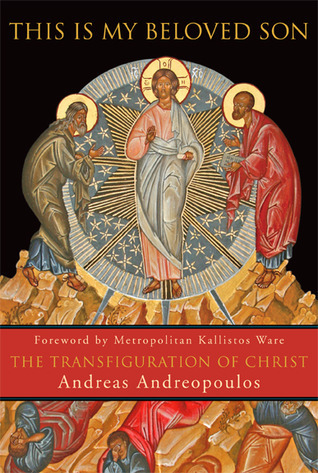 In accessible language, Andreopoulos offers his own reflections on such questions and on the place of the Transfiguration in the Gospels as a whole. This a beautiful and accessible treatment of the Transfiguration from the perspective of a Greek-Orthodox Christian. Andrepoulos explores the Biblical account, subsequent theological reflections on the event and how the Transfiguration relates to the liturgical practice of worship in the Eastern Church (in the transfiguration God's glory is revealed).